Could 350.org’s aggressive new strategy bring an end to global warming? 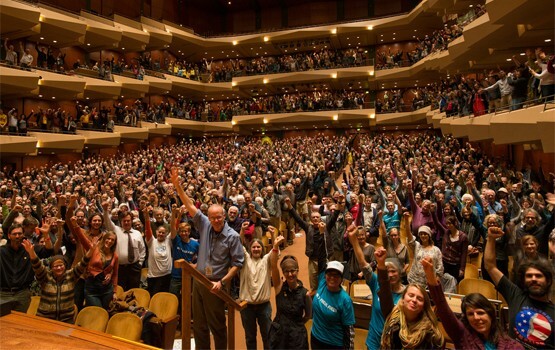 Bill McKibben and about 1900 supporters raised their arms in support of the new 350.org strategy in Seattle’s Benaroya Hall on Wednesday, November 7. Photo by Paul Anderson. In a bold change of direction for the movement to stop climate change, environmentalist Bill McKibben and his global advocacy network 350.org unveiled a new strategy this week in Seattle: chip away at the power of the fossil-fuel industry through a large-scale stock-divestment campaign modeled on the one which helped bring down South Africa’s apartheid regime in the 1980s. That math is simple but stomach-dropping. Global leaders who drafted the 1999 Copenhagen Accord—including leaders of the United States and China who are resistant to climate action—agreed that a rise of two degrees Celsius (about 3.5 degrees Farenheit) above pre-industrial temperatures is the absolute upper limit humanity can approach and still avoid catastrophic climate change. In order to stay within that limit, we can emit no more than 565 additional gigatons of carbon dioxide into the Earth’s atmosphere. But fossil fuel corporations already possess oil, gas, and coal that would release 2,795 gigatons of carbon if burned. That’s five times the safe amount. This entry was posted in News and tagged 350.org, apartheid divestment, Benaroya Hall, Bill McKibben, Copenhagen accord, Desmond Tutu, dirty energy, Do the Math, fossil fuel divestment, global warming, Josh Fox, Kumi Naidoo, Van Jones. Bookmark the permalink.